Holmes has since settled with the SEC, with no admission of wrongdoing, but is now facing up to 20 years in prison, awaiting a criminal trial for charges of wire fraud and conspiracy to commit wire fraud. She has pleaded not guilty. The testimony, obtained by ABC News “Nightline,” has never been broadcast until now. “Did it concern you that a number of tests weren’t working on Theranos’ devices?” an SEC attorney asked Holmes. “I know that we made mistakes,” Holmes replied. Her story is a stunning fall from grace for the woman who was once poised to change the world. Her technology had promised to run hundreds of lab tests from just a drop or two of blood. It was a promise she would never fulfill. In 2003, Holmes launched a company which she would come to name Theranos, a combination of the words “therapy” and “diagnostics.” She officially dropped out of Stanford University during her second year of college to pursue her business full time. She wanted to create a portable device that could process any blood test with just a drop or two of blood from the finger. The ability do to a large number of laboratory tests from a small amount of blood would revolutionize health care. “If you think about a newborn, for example in the hospital, who is having blood drawn repeatedly, certainly that newborn doesn’t have a lot of blood to give… if you could get things from the amount of blood that you’d get from a finger stick, that would be something that would clearly advance the game,” said Dr. Stephen Master, a pathologist who interviewed Holmes on stage in 2016 at the American Association for Clinical Chemistry’s Annual Scientific Meeting. Holmes hoped her technology could make Theranos the Apple of health care. Former employees and insiders say that she was obsessed with Steve Jobs and that she wanted to mimic him at every turn, from those signature black turtlenecks to recruiting his former number two, Avie Tevanian, who led the software team that developed Mac OS X.
Tevanian said he was very impressed when he first met Holmes. He joined Theranos’ board of directors, but it wasn’t long before he said he started to see red flags. Tevanian would raise a lot of concerns and questions with Holmes about the product and the direction of the company. It was something he quickly realized Holmes did not appreciate. He said she started to ignore him and eventually she had another board member, venture capitalist Donald Lucas Sr., ask him to resign, which he did. Despite losing Tevanian, Holmes forged ahead but was running out cash and said she was considering doing an equity raise, essentially trying to find new investors to buy into her company. The trouble with that was timing. This was in the midst of the Great Recession. Even companies that had been around for generations were struggling to get loans and many were going out of business, but Holmes found someone to help. In 2009, she got an enormous loan from a former software executive named Ramesh “Sunny” Balwani. After loaning Theranos the money to stay afloat, Balwani came on as the president and COO, becoming the most powerful person at the company after Holmes. “Did he have any qualifications in the lab testing business?” SEC attorney Jessica Chan asked Holmes in the deposition. “He did not,” Holmes replied. “Or in pathology or anything like that?” Chan asked. “Not to my knowledge,” Holmes said. Employees thought that Balwani seemed like an odd choice but together the pair embarked on a collaboration that would be a game changer for the company: a partnership with Walgreens. In her deposition in front of the SEC, Holmes said they were interested in partnering with Walgreens because of their retail footprint. At the time the drugstore giant had more than 8,000 stores and if Theranos could get its technology into every single one, that would mean being on almost every street corner in the country. Walgreens saw the chance to be at the forefront of something huge and the potential to make millions or even billions of dollars in revenue. After a number of negotiations, they cut a $140 million deal with Theranos. By 2013, the company had opened its first Theranos Wellness Center in Palo Alto, California, and by the following year they had expanded to Arizona. Holmes became a media darling, making the rounds on the conference circuit, doing TEDMED talks and appearing on the cover of magazines. She was interviewed by former President Bill Clinton on stage at the Clinton Global Initiative and appeared on almost every major television network. She even launched a flashy advertising campaign with Academy Award-winning filmmaker Errol Morris. Adding to the media fascination was the all-star board of government heavyweights that Holmes had assembled. It included former Secretaries of State George Shultz and Henry Kissinger, former Secretaries of Defense James Mattis and William Perry, former U.S. Senators Bill Frist and Sam Nunn, and former U.S. Navy Officer Admiral Gary Roughead. By 2014, Theranos is valued at nearly $10 billion dollars and with the media attention plus the impressive board of directors, Theranos had attracted high-profile investors including the founders of Walmart($150 million), media mogul Rupert Murdoch ($125 million) and The DeVos family, including now Education Secretary Betsy DeVos ($100 million). But for all the hype on the outside, on the inside things weren’t going as planned. According to employees there at the time, the technology still wasn’t working. Cheung started at Theranos after graduating from the University of California-Berkeley in 2013. She remembered being excited about joining the company and working for Holmes. She was not only inspired by the prospect of changing the world but also potentially making health care more accessible and affordable. “Being bright eyed and out of university, that was pretty appealing, pretty exciting for me, and everyone I had interviewed with was just as excited and just as enthused about the products and services as I was,” Cheung recalls. She started out in the research and development lab but quickly moved into the clinical lab where patient samples were being processed. It wasn’t long before she started to realize that something didn’t seem right. Cheung said that the quality controls on the machines kept failing. “How it was handled totally blew me away… they took out data points,” Cheung said. Pathologist Dr. Stephen Master explained why alleged cherry-picking of data is extremely problematic. “Imagine that your machine is actually failing half the time… if you keep rerunning your quality control… eventually you’ll find those happy times when it seemed to work and you’ll tell me that everything’s working perfectly. But that other half of the time patient results might be being released and that’s going to be wrong,” he said. But despite these failures, Cheung said Theranos was still processing patient samples and that a supervisor instructed her not to speak up. As she saw these problems escalate without being addressed, Cheung eventually left the company only seven months after she started, and later filed a formal complaint with regulators. Breast cancer survivor Sheri Ackert was one of the patients whose results were processed incorrectly by Theranos. Ackert lived outside of Phoenix, Arizona, and had worked in health care administration for over 30 years. As a cancer survivor, she would have her blood tested regularly and was recommended to try a Theranos lab by her doctor. When Ackert received her Theranos results, the amount of an estrogen hormone called estradiol was alarming. As someone who was postmenopausal, Ackert said she should have little to no estradiol and the result was over 300. Ackert called her oncologist’s office. Even more alarming, the Theranos results didn’t indicate that something was at a potentially high and dangerous level for a postmenopausal woman. After surviving breast cancer and going through a bilateral mastectomy, the thought of having a tumor was unbearable. “I will never forget that day,” she said. Her doctor told Ackert to go in for more for tests, but this time recommended a non-Theranos lab. “It was about a week later I got the call from my doctor and he said congratulations your estrogen is basically nonexistent,” Ackert said. The Theranos tests had been off by hundreds of points. Many inside the walls of Theranos said they knew of problems but that they were scared to speak up because of the company’s culture of fear. However there was one unlikely whistleblower who was willing to take the risk: Tyler Shultz. Shultz is the grandson of George Shultz, the former Secretary of State who was also a Theranos board member. He had met Holmes while he was still in college at Stanford University. In a deposition obtained by “Nightline,” Shultz recalled being impressed with Holmes’s vision, so much so that after graduation he wanted to work for the company. In fall 2013, he started as a research engineer at Theranos but it wasn’t long before he said his impression of Holmes changed. “I wasn’t impressed by her management skills and I felt like she was very manipulative,” Shultz said in the deposition. One of the major falsehoods that Holmes told to his grandfather, he said, was that Theranos devices could run hundreds of blood tests from a single drop of blood. “My grandfather would go get a Theranos test done, and he would have a needle in his arm… and there’d be some excuse why there needed to be a venous draw for him, but for everyone else it’s a finger prick and he continued to buy into that.” Shultz said in his deposition. Another issue, Shultz said, was that the majority of Theranos tests weren’t even run on actual Theranos devices but rather on third party, commercially available, modified and unmodified machines. “While I was working there we only ran seven tests on the Theranos devices,” Shultz said in the deposition. But what Shultz said really bothered him, and other Theranos employees, was that of the tests that were being run on Theranos devices, many produced inaccurate results. “I think that at the end of the day, everyone was concerned that we were not giving patients the right results,” Shultz said. Shultz said he eventually decided he would raise his issues directly to Holmes. He had a personal relationship with her because of his grandfather and was hoping that she would be receptive. After attempting to set up a formal meeting, he settled for an email outlining his concerns. But rather than a follow-up from Holmes, Shultz received an email, obtained by “Nightline,” from Sunny Balwani. Rather than an apology, Shultz sent his two-weeks notice and said he went to meet with his grandfather later that day to tell him that he had quit. “He said, ‘They’re trying to convince me that you’re stupid, but they can’t do that. They can try to convince me that you’re wrong and in this case I do believe you’re wrong,'” Shultz said. Shultz said that his grandfather went on to tell him that Theranos devices at that time were being used in medevac helicopters and in operating rooms. “I remember saying that there is no way that could have been true because the devices were barely working in the walls of Theranos.” Shultz said in the deposition. Having made no progress with his grandfather, Shultz eventually took his concerns to John Carreyrou, a Wall Street Journal investigative reporter and author of a book on Theranos called “Bad Blood: Secrets and Lies in a Silicon Valley Startup.” But it wasn’t long before Theranos got wind of it and attempted to use George Shultz to silence his grandson. Tyler Shultz said in his deposition that he tried to reiterate his concerns to his grandfather again, but that George Shultz continued to believe Holmes. “And then, he just says, ‘again whatever the case may be, will you just sign this one page document to make everything go away?’ And I said, ‘yeah, I will definitely sign that.’ And he said, ‘well there are two Theranos lawyers here right now, can I go get them? '” Shultz said in his deposition. Tyler Shultz said he learned only then that there were two Theranos lawyers waiting in another part of his grandfather’s house. “I was totally surprised,” Shultz said in his deposition. But according to Tyler Shultz, he never signed anything despite pressure from those around him. “My grandfather would say like, things like, ‘your career would be ruined if this article comes out. '” Shultz said in his deposition. But in the end, thanks in large part to Tyler Shultz, Carreyrou was able to publish the first of many explosive Theranos articles beginning on Oct. 15, 2015. The first article stated, among other claims, that the company “isn’t using its technology for all the tests it offers” but instead, was using “traditional machines bought from companies like Siemens” to run the majority of its tests. After the publication, the fallout happened quickly. Within two weeks, Walgreens halted plans to open any new Theranos Wellness Centers. By January 2016, federal lab inspectors issued a warning that Theranos’ blood tests “pose immediate jeopardy to patient health and safety.” Not long after the warning, federal regulators banned Holmes and Balwani from running a laboratory for two years. By May 2016, Theranos had voided tens of thousands of test results from the past two years. The following month, Forbes had cut Holmes’ net worth from $4.5 billion to $0 and Walgreens terminated its contract with Theranos. By the end of the year, the company faced multiple lawsuits from patients, investors and Walgreens. It wasn’t long before Holmes and Balwani found themselves in the throes of a federal government investigation. For three days in summer 2017, both Holmes and Balwani were questioned by the SEC. Holmes said the words “I don’t know” over 600 times. 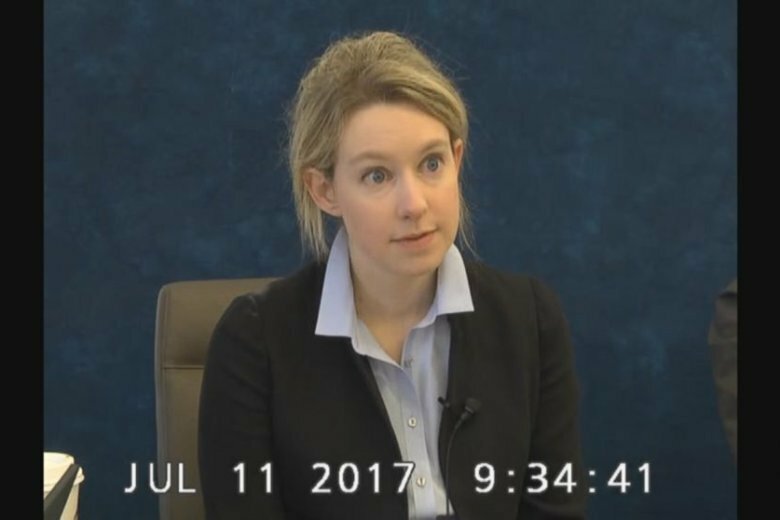 The claims she had made about the capabilities of Theranos were put under the microscope and her carefully crafted narrative began to unravel. Plus, there was another detail revealed that Holmes had been less forthcoming about: She admitted that she and Balwani had been living together and had engaged in a romantic relationship. It was something she admitted under oath but had kept from investors. Her brother Christian Holmes V said in his deposition, obtained by “Nightline,” that the couple’s relationship ended right around the time Balwani left the company in May 2016. As the alleged misrepresentations added up and Holmes’s grandiose vision versus reality became clear, the SEC brought its charges of fraud against Theranos, Holmes and Balwani. Balwani chose to fight the charges but Holmes and the company reached a settlement without admitting any wrongdoing. Their legal trouble continued when months later, the U.S. Department of Justice charged Holmes and Balwani with wire fraud and conspiracy to commit wire fraud. If convicted, they could both land in prison for up to 20 years. Both Holmes and Balwani have pleaded not guilty. By September 2018, the company was dissolved and some on Holmes’ board began to see things differently. Holmes and her counsel did not respond to our repeated requests for comment. But Sunny Balwani’s attorney, Jeff Coopersmith, agreed to sit down with “Nightline” for his first in-depth TV interview regarding Theranos. “Obviously when we look at this after the after the fact it has been a business failure… And you know Mr. Balwani is very sorry about that… but that is not fraud,” he added. To this day, Holmes, Balwani and the company deny any wrongdoing. They have both pleaded not guilty and are awaiting a criminal trial which could land them both in jail for up to 20 years. Hear more on “The Dropout,” a six-part podcast series on the rise and fall of former Silicon Valley darling Elizabeth Holmes and her company Theranos. It is written and produced by Jarvis, Taylor Dunn and Victoria Thompson. Listen to “The Dropout” for free on Apple Podcasts, Google Podcasts, iHeartRadio, Spotify, Stitcher, TuneIn, the ABC News app, or your favorite podcast player.